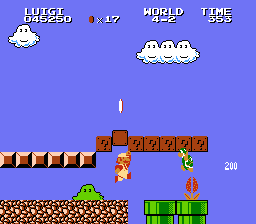 FDS Super Mario Bros. 2 (JPN) "warps, Luigi" in 08:17.83 by Deign. This is a TAS of the Japanese Super Mario Bros. 2, a.k.a. 'The Lost Levels', using a suboptimal punk called 'Luigi'. He jumps higher than Mario, but acts slower in many ways. However, the movie is in no way worse than the Mario version - some new creative solutions have been found. This is a 189 frame improvement over the previous movie.